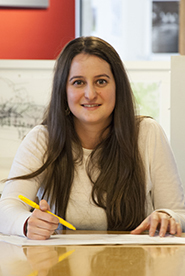 Courtney is a registered architect and Project Manager at DSK. Courtney has extensive experience with residential, institutional, and civic projects, including luxury high rise condominiums and commercial office buildings within the City of Boston. Her ability to translate design to construction has cultivated her quick problem-solving skills. She also specializes in using 3D-modeling and rendering to provide understandable visual design representations for our clients. Courtney grew up in her father’s machine shop where she watched specialty tools go from concept to completion. Spending time in this environment showed her how much she enjoyed watching things go together which translated into a summer co-op building houses with a local carpenter. Courtney received her Master of Architecture from Wentworth Institute of Technology. Outside of work she spends time renovating her house, building furniture with her husband, hiking, and gardening.